Dockmaster's Cell: 941 374-2310; office: 941-722-5936 ext. 212: Fax: 941-723-6639; Hail on VHF Channel 16; Communication on Channel 68. Our Dock Master is available everyday with the exception of Monday. He will be happy to greet you when you arrive and assist you in docking. There is average 9 foot depth in the channel to the Club, 6 feet at low tide. Follow the Manatee River Channel from Tampa Bay. Use caution at the river entrance and hold the red markers close to your starboard. Follow the channel to flashing red "14" and turn northeast to RED "2." Hail our Dockmaster on Channel 16. Our Dock Master is available everyday with the exception of Monday. He will be happy to greet you when you arrive and assist you in docking. 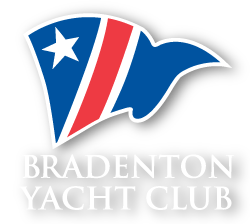 Please contact him on VHF Channel 16 or by the Dockmaster’s Cell 941 374-2310. If you would like to make a reservation to visit the club by sea for either lunch, dinner or an extended stay, please call the Dockmaster in advance for a reservation and so that we expect your arrival. Chart for reference only and not for navigation purposes.